Most of my classmates at elementary school dreaded the 'Concours d'art oratoire' that we were forced to do every year as part of our French class. It was a project designed to help us develop our French speaking and presentation skills. Basically we were required to write a 3-5 minute speech on a topic of our choosing and present it to our class. I loved it. If we were lucky enough, we would get selected to represent our class at the grade level within the school. If we were really lucky, we would then get the opportunity to compete against students from other schools. I'm pretty sure that every year I won by default because NO ONE else wanted to advance. To me, it was fun... I got to talk about whatever subject I wanted (apparently my pet hamster was very important to me in Grade 4) and the best part was hearing people laugh as I was telling my stories (perhaps they were just laughing at me and not my stories but I didn't care - I loved the feeling of making people laugh). Since that time, I have had no problems presenting my ideas to various groups of people; doing oral presentations throughout university, teaching students in elementary school, high school and college, instructing various types of fitness classes, and running workshops on different health & fitness topics. Clearly, I like to share my ideas with an audience! As I've gotten older, I've realized that as much as I enjoy making people laugh, that I also have the power to make people think! Sometimes people will tell me that they've altered their behaviour and are feeling happier or healthier because of something I have shared. Nothing makes me happier than inspiring others to make positive changes. Nothing. 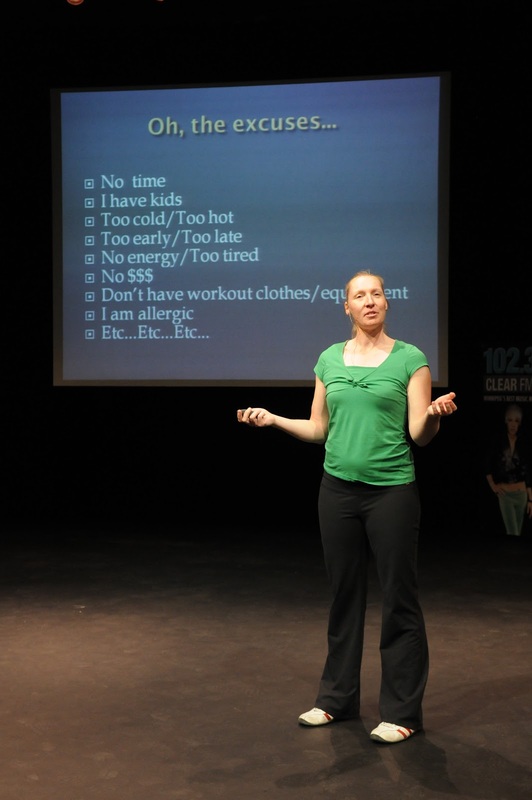 Now, I am super excited to be expanding the speaking portion Surefire Fitness by delivering more workshops and specifically, keynote addresses. Keynoting allows me to combine my expertise in health & fitness, my love for making people laugh and think, and my desire to share and inspire. I'm happy to report that my latest keynote creation is ready to go... It's called "Throw Your Scale Away! Stop Measuring. Start Living." It's ideal for corporate audiences, high school students, and fitness enthusiasts. The goal of my new keynote presentation is to make people think about how they measure success in their lives. I look forward to sharing it! Other Keynote titles include: "The Magic Bullet to Positivity" and "The Five 'S-Words' for Health Success"
Click here for more information on how to book Kate for your next event.